I was able to get downtown last night to pay last respects to Lincoln Alexander and shoot this video of his motorcade pulling out and heading to Hamilton. 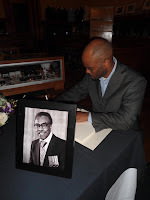 There's plenty written about his life, work and legacy all over the internet - he lived a life dedicated to not only making Canada a better place, but also to inspiring people to do the same. "I'm proud of being black, but my role in Canada is to serve all the people. I'm a Canadian. Period."